The Ramsaysburg Homestead is a historical park. These twelve wooded acres along the Delaware River, just south of the Delaware Water Gap, are leased by the Township of Knowlton from the State of New Jersey Green Acres program. 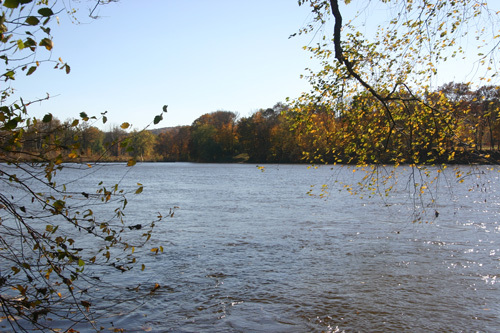 The public may access the river here for fishing or to launch small watercraft such as canoes or kayaks. The property and the structures on it are the remains of a fifty-acre tract settled in 1795 by Irish immigrants James and Adam Ramsay in what was then New Jersey’s northwestern frontier. An earlier tavern continued by the Ramsays, a store established by them and eventually a post office, a lumberyard, a sawmill, a storehouse, a blacksmith shop, tenant houses and other buildings, either built or acquired by the Ramsays, comprised the principal elements of the homestead and hamlet bearing the Ramsay name. 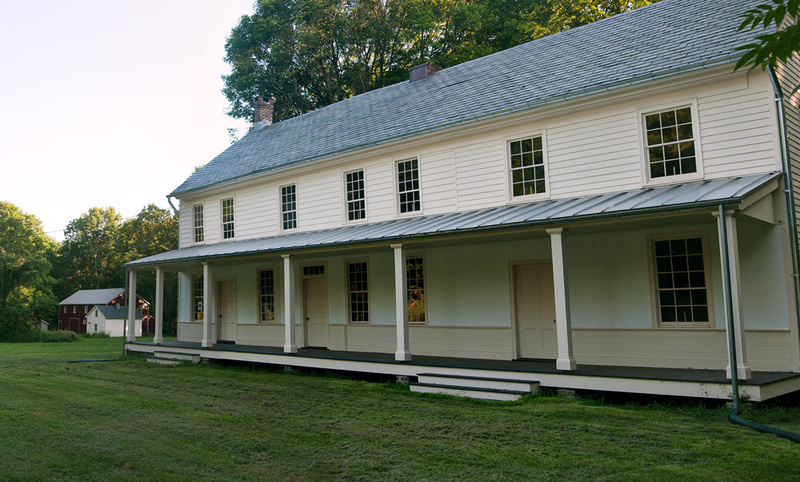 The buildings that you see here—a tavern, barn, cottage, smokehouse and shed—were built from 1800 to 1870, and represent the activity that occurred at the homestead during its heyday. The Delaware seen from the river bank at Ramsaysburg. Green Acres acquired the property in 2000 to become a part of the Beaver Brook Wildlife Management area. But the Department of Environmental Protection was unable to maintain or protect any of the structures of the hamlet. 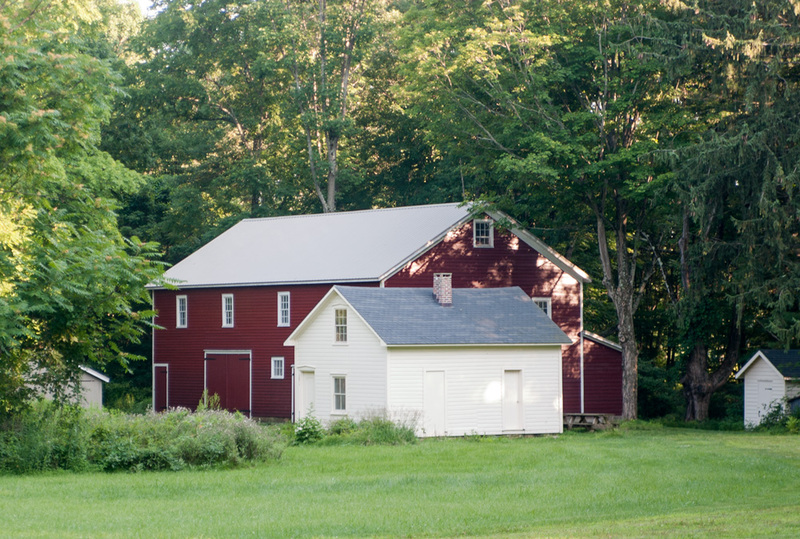 The Knowlton Township Historic Commission worked with the Township of Knowlton to arrange a lease of the property from the DEP.Although they’ve seen their share of abuse and neglect, the remaining structures are relatively true to their original form, and are irreplaceable. They have survived flood and fire, as well as demolition in our modern era of fast-paced real estate development. 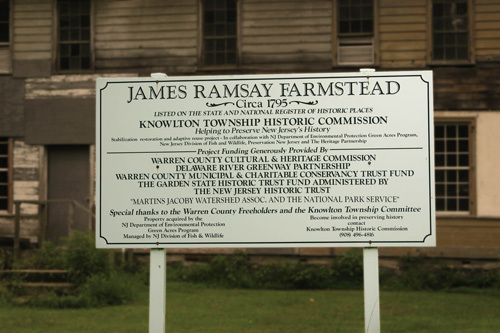 To learn more about Ramsaysburg, or the Knowlton Twp Historic Commission, please check their website, email or call 908-496-4816. Or follow on Facebook! The property is located at the intersection of Ramseyburg Road and Route 46, east of the village of Delaware.